Beston’s seventh release of original material is stripped down to simple arrangements for guitar and voice. The songs too have been stripped down to reveal bare heart-ache, skeletal longing. Taken together they form a story (just as their titles form a kind of poem), a relationship arc from break-up to forgetting. Each song explores in some way, both melodically and lyrically, the dual nature of being alone: the heaviness of loneliness weighing down the stark lightness of freedom. 8. woven into one shimmering thread. The old advertising slogan, “been there, done that,” comes to mind almost unbidden when one is presented with music by a singer-songwriter whose voice is accompanied by an acoustic guitar. The scene is abundantly populated with people who arrange their music in this tried and true fashion. So it is incumbent upon such artists to make their songs intriguing, be it through emotional vocals, insightful lyrics, innovative song structures, or instrumental skill: preferably an artful combination of them all. On his latest release, loneliness and freedom waltz together through the night, Nashville expatriate and current North Park resident Beston Barnett has crafted a sound that is unique and interesting. A long-time practitioner of genres as varied as world music and hip-hop, he creates an atmosphere that is warm and sincere. And he does it with just his voice and a guitar. This CD is more of an EP than an album, clocking in as it does at a little under half an hour. However, it is instantly appealing from the first song “the only way to go is alone”. Barnett’s voice is warm and inviting, expressing a sincerity that is hard to resist. His guitar playing is interesting, in that he makes unusual choices of chords and techniques that lend an exotic quality to the songs. More often than not, he opts for an intricate finger picking style instead of merely strumming the chords, which adds texture and complexity to his music. The title song is notable for its straightforward presentation and unusual lyrical imagery. Its protagonist is seemingly going through the routine motions of living, yet he manages to find deep meaning in the most mundane of observations. The music twists and turns through some unexpected chord changes, at times evoking the late Michael Hedges at his best. The follow-up track, “in a beautiful place with high mountain air”, might also be a strong contender for the title, as its lovely melody and lyrics are perfectly suited to the pristine and sparse arrangements that define this recording. In fact, all of the tunes have a real tendency to get under your skin after a while. And that’s a good thing! Barnett has a curious penchant for long song titles, but he crafts songs that are succinct and to the point. While this collection’s short running time might be considered a negative by some, it serves one of show business’s most cherished tenets: always leave ’em wanting more! how long would you love me? how true would you be? in the balance with your pen? would you break? would you bend? even then, would you love me? how much would you know? and if the cost is your name? will you think of me then? how deep would you cut..
would you burn them again? and again, would you love me? how far would you take me? how clean would you break? in the end, would you love me? will you think of me now? will we all end so low? woven into one shimmering thread. 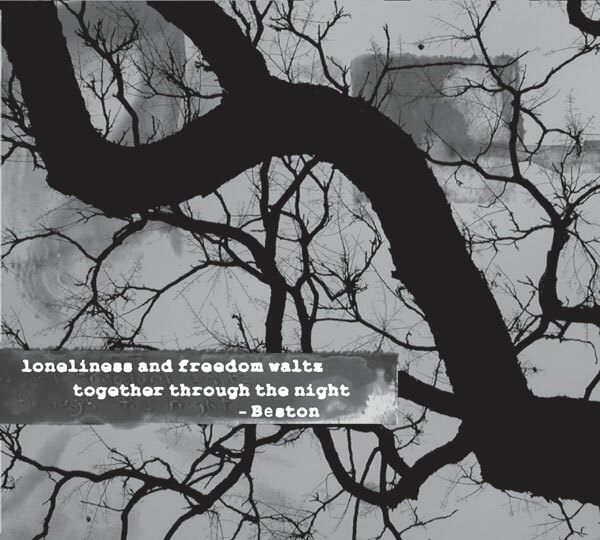 Categories: album, loneliness and freedom waltz together through the night (2007) | Permalink.